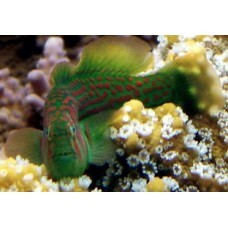 The Green Clown Goby, also known as the Earspot Coral Goby, is common within the reefs of the Indo Pacific, found usually among soft and hard coral colonies. They are a small stocky shaped fish with a very large head for their size. There are many different color variations, and this species is a yellow to greenish-tan colour with orange vertical stripes on its head. They are a peaceful fish that makes a wonderful addition to a reef aquarium containing colonies of polyp corals, as they enjoy swimming and hiding amongst the polyps. However, they may nip at the polyps of SPS corals. It requires a 10 gallon or larger aquarium preferably with branching coral. It will rarely become aggressive towards other fish, but will fight with its own kind in smaller tanks. Therefore, it is best if it is kept with other docile species.